Yes, it's true! Last night I became the mother of kittens! Two boys and girl, all from the same litter. The boys look very similar, the girl has long hair and a flatter face. All have very different personalities but they are healthy, unafraid and already keen to bond with us and explore their new surroundings. 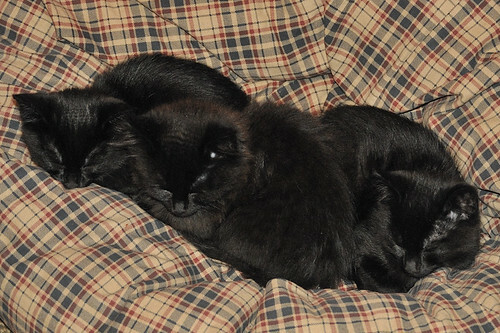 They were born on Hallowe'en 2008. One of the boys and the girl. 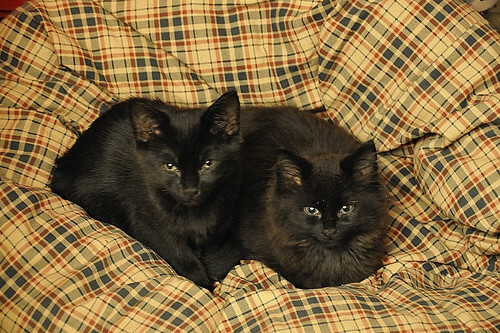 We got them via the RSPCA, so had a nominal cost to pay for their first jabs and microchips. We've had to undertake to have them neutered as well but that won't happen for a few months yet. Names are yet to be decided. Suggestions in the comments will be welcome, we're beginning to get a bit desperate although after their first 'quiet' evening with us in the lounge we're considering Sid, Johnny and Nancy. What wonderful kittens! And I think Sid, Johnny and Nancy would be fine names. Oooh - I want to skritchel them all behind the ears and hear them purr. A friend of mine just adopted a gray kitten and named her GrayC. We took in a stray cat which we had for about a week. I named her Josephine, after Napoleon's wife, because she was kind of diminutive in a Napoleonic way (except female), but her new owner named her Fez - short for Pheasant, because her calico markings look like a pheasant's feathers. They are great, although extremely wicked with the usual cat fondness for sitting on keyboards and chewing cables. 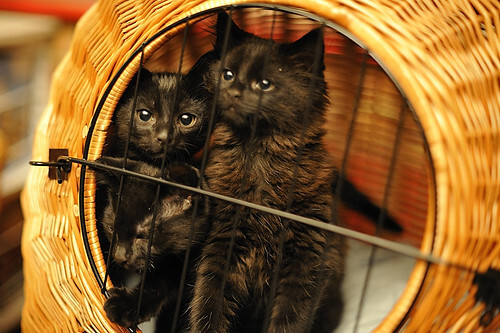 Just popped back to say that I think Rook, Crow, and Raven seem like the perfect names (and bad, evil, and naughty though they may be, I'm sure it's still hard to resist their kitten charms!). How gorgeous they are! Congrats!